Добавить в корзину 5 шт. на сумму 400 руб. 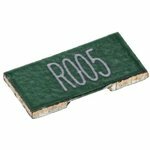 The TLR series high power metal chip resistors for current sensing applications, are constructed to prolong terminal life by having its metal resistive element and barrier layers beneath the solder. TLR resistors are ideal for use in combination with a range of IC&apos;s for battery charge management and low voltage power supplies, where a low ohmic shunt resistor is required to act as a current sensor. TLRs are particularly suited to applications in the automotive industry for sensing in EMU&apos;s.